This Easter weekend saw Agrumi collaborating with the National Trust and Cadbury’s to provide children of all ages with delicious fun. 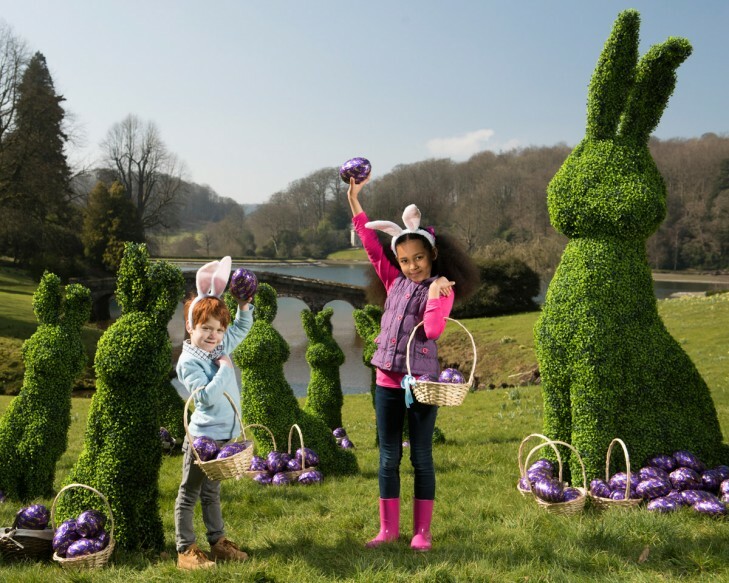 It’s the ninth year that the famous chocolate producer has sponsored Easter egg hunts at over 250 Trust properties around the country. Looking for a novel way to publicize the events through a photo shoot the public relations company involved contacted Agrumi for ideas. 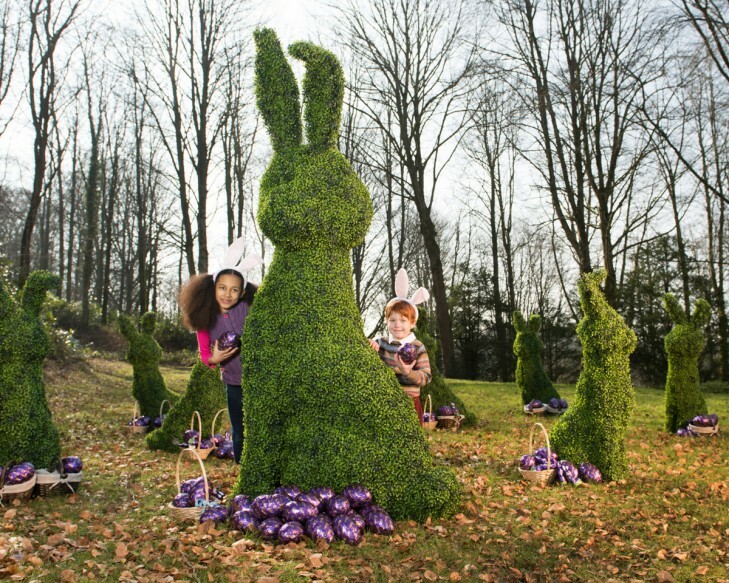 As a tribute to the ongoing commitment of Cadbury’s to the event we made eight oversized, 122 cm bunnies and one giant 244 cm bunny in the image of the company’s Easter-focused rabbit logo. Each figure is unique with detachable heads and legs giving the PR stylist great flexibility in displaying them for the camera. Beneath a covering of expertly applied artificial box plants the figures have been realised through frames made from steel wire. Added together the wire would stretch the length of seven football pitches! Although David Beckham could probably run that in a minute, it took our chief topiary artist rather longer to make the nine bunnies come to life. Nonetheless, we delivered this sizeable commission to Cadbury’s and the National Trust in less than a couple of weeks. The main photo shoot took place at Stourhead, the Trust’s beautiful Palladian mansion in Wiltshire. Ably accompanied by two adorable children you can see that the bunnies did Agrumi, and the Trust proud and look just like the Cadbury’s original. 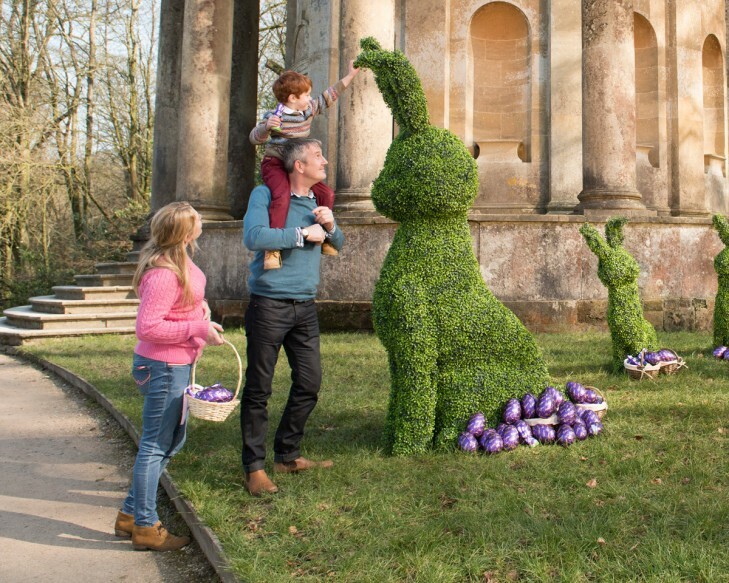 Now the 244 cm rabbit is staying at Stourhead while the other bunnies have made their way to the Trust properties at Wimpole, Stowe, Fountains Abbey, Hardwick Hall and Tredegar House to advertise their Easter events and inject more fun into the celebrations. 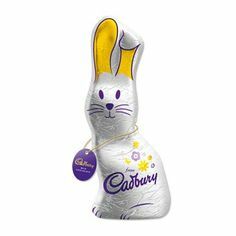 The remaining 122 cm bunny is being used by the Trust and Cadbury’s as a competition prize on social media. Contact us to see how some glorious Agrumi topiary could boost awareness of your products and company.